Finding the perfect toys for your baby can be difficult. There are a variety of toys available on the market, and sometimes these toys contain harmful ingredients and contain toxic paints or low-quality materials. What makes shopping for baby toys even more disconcerting is that often toys made in factories in countries like China do not have quality and safety standards that are regularly followed. Parents who have made the decision that they want to make sure they only give safe toys to their babies know the importance of purchasing non-toxic baby toys. What I really like about this product is that this wooden baby rattle features an intensely soothing rattling sound which helps to calm and enchant a baby. The rainbow colors and BPA-free plastic rings really help to keep the baby happy while playing with this rattle. Add to this the fact that its good for teething babies and it is not too big, it makes a great toy to keep on hand and in the to-go diaper bag. It is really nice to have at the doctor’s office and on car rides because it really helping with the calming baby. These non-toxic wooden dolls are great for younger children and toddlers. They are made of natural wood and contain no toxic chemicals and are not made in China. This makes me feel more comfortable offering them to my children. I like that they allow a toddler to be creative and we can use paint or pretend to make a family with them. This is a great all-around toy for babies and young toddlers. My kids love this one, because of the smooth texture and beautiful colors. It gives them the opportunity to solve a problem and is great for keeping them engaged in play for a period of time. All the paint used in this toy is completely non-toxic. Another thing that really wins me over with this toy is its durability. I know it is well-made and will be a toy that I can potentially pass down to my own kids, because of it’s high-quality craftsmanship. 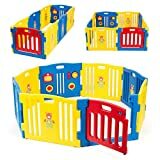 This Hape Gourmet Play Kitchen set is a really great set that can be trusted not to fall apart or start paint chipping. It features toys made from wood and bamboo and a salt and pepper shaker that make a real shaking sound. Another great feature of this set is that the colors are gender neutral, so they are perfect for both boys and girls to play with. It’s one of our favorite non-toxic toy sets for under $20. 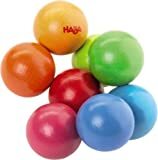 This interesting toy features wooden balls in bright fun colors made with non-toxic paints. One reason I love this toy is that it allows my child to be able to move the balls and even when she was younger she liked watching me play with the balls and it helped us interact together. 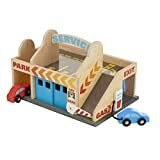 This is one of my favorite car toys because it keeps my daughter busy while we drive, and the fact that it is under $20 is great for staying on budget. I like that it helps children learn how to grab onto things and figure out how to move things. This is a fabulous truck and car set. 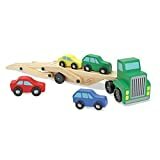 One of the features is that the cars can be used on standard wooden train tracks and that makes it a great addition to our toy chest because it can be used with our other sets. The toy doesn’t have any sharp edges and stands up great to heavy play and use. Children love this toy and it quickly became a favorite, because of the various capabilities and design of the tow truck. It offers lots of fun and engagement and for these reasons, it’s picked as a top non-toxic toy under $20. This handmade wooden rattle is incredibly smooth and gentle on baby’s fingers and gums. It is completely handmade, organic and very safe for baby, which is why it is one of our top picks for toys under $20. This is a soothing toy that provides an enjoyable sound made from the wooden rings in the middle of the rattle. This product in the under $20 category features only super safe fabrics and is a good size for a baby. Its size and softness are perfect for calming baby during a trip to the doctor or while out in the stroller. They come in a 5 pack which allows parents to easily freeze the toys and then give them to baby throughout the day. This plastic features varied textures which helps baby to deal with teething pain. This toy is environmentally friendly and made with all nontoxic ingredients. It is made from recycled plastic milk jugs. 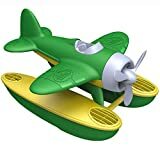 It is a great toy for bath time because it floats, and kids love playing with the big green plane. Our top pick for under $20 bath time toy. This teether is shaped like a raspberry and has small nubs on the surface which help babies experiencing teething pain. The teether is a favorite for babies who like pacifiers as it is similarly shaped. It is made from 100 percent food grade silicone that is BPA free which makes it a great choice for discerning parents. The product is designed for children age four and up and is very easy to clean up and wash off. What is great about this lovey is that it provides different textures for baby to cuddle with and touch. All the textures are soft and super comforting which helps to calm baby. 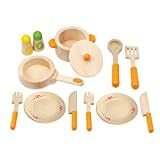 Nontoxic wooden food set in our $20-$50 categories which can be a great addition to a home kitchen set. 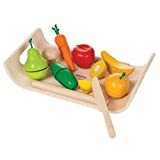 Watching the children delight over learning to cut their own fruits and vegetables is almost as much fun as they have with this set. The toys feature Velcro which keeps them together and allows children to slice through them with the wooden knife. It features vibrant colors made from safe water-based dyes. This set is environmentally friendly because it is made using wood from rubber trees. The set includes a teapot, sugar bowl, creamer jug, teacups, saucers, and spoon. It’s really cute that they actually include tea bags and sugar cubes in the set when you purchase it, which is perfect for a tea time with your little one. This is a great toy set for children who may usually get distracted from their toys. It has a variety of moving parts and helps to engage children into playing for a long period of time. The parking garage and car wash give them a variety of ways to play with this toy. The durability and craftsmanship make this a toy you will likely use for many years. 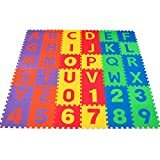 This playmat is made from nontoxic EVA foam. It is super durable and easy to clean. It features bright colors and comes with a lifetime replacement guarantee. 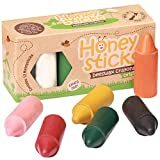 These crayons are made from 100% New Zealand Beeswax. One great thing about these crayons is that they break less than normal crayons. This makes them a winner for the price and they are safely made without paraffin wax. Need more non-toxic crayons picks? Check our complete review. The entire EverEarth design is non toxic and safe for children. It provides endless fun and actively engages children. The wood is highly durable and contains beautiful vibrant colors. Has eight interchangeable panels and it has bright bold colors. It is stable when put together and you will not need to worry about your child knocking over the sides. It is BPA and lead-free. Overall while some parents might think that purchasing it is going out of the way to purchase non-toxic baby toys, it really comes down to doing smart shopping. 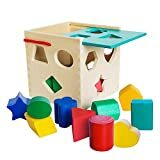 You can easily find great toys for under $20 and seen in some of our favorites we’ve reviewed, such as the Classic Wooden Shape Sorter Toy with Hinged Lid & Carrying Strap. There are various options available on the market to accommodate any budget. There is no reason to feel guilty for giving your child the best products that you know will help them grow and learn in a positive and safe way. Most people think that toys made for babies would be safe for babies. Unfortunately, this is not the case and it creates a major problem for parents who want to give their children the best upbringing possible. Parents feel stuck between offering their children toys and potentially offering them a toxic ball that will go immediately into their mouths. Manufacturers truly understand parents’ dilemmas and have incorporated safe practices into their toy production that ensures that parents can purchase anything from teethers to teddies without having to question if the processes involved in production involves cheaping out on the materials. Some parents worry that finding these toys will be expensive and put them in a precarious financial situation if they decide to go the safer route and purchase from companies that invest in the future of children. Happily, this is not always the case. Parents can find non-toxic toys on almost any budget, and in fact, there are a variety of future-looking companies that offer well-made products for parents. You want to pick toys that are free from toxic chemicals and avoid plastics that contain BPA, PVC and lead and paints that contain heavy metals. Also, consider avoiding synthetic fibers in fabrics. Parents looking for the best fabrics will likely choose all natural cotton and nonsynthetic materials like bamboo or wools. Certain materials are safer than others, wooden toys that are made from bamboo, walnut, alder, beech or maple and are not covered in paints or stains that contain harmful toxins are likely the best toys for baby. 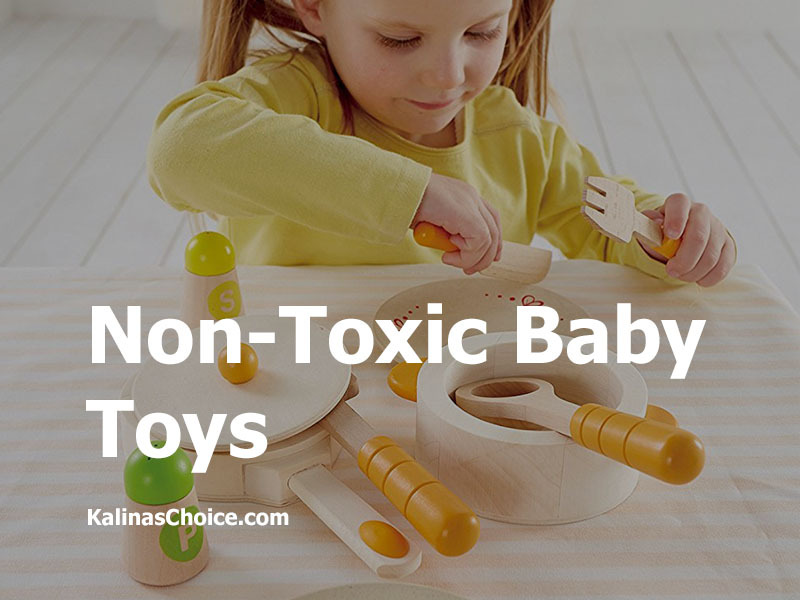 Make sure that the wooden toys you purchase only use non-toxic colors. Some parents feel wooden toys don’t provide all of the fun and needs for their children. For this reason, some parents do allow their children to play with plastic toys. When choosing these plastic toys, parents should stick to toys that are made from 100% food grade silicone and plastic that is completely BPA free. In addition to purchasing new toys from manufacturers who only produce toys with the highest safety standards, it is important to make sure you don’t have old toys lying around that could pose a safety threat for your child. Toys that are hand-me-downs or gifts should be inspected and if need be tossed into the garbage. Products that contain lead often get recalled by the manufacturer, so it is important to check if toys that you already own have a recall warning. Make sure to check toys twice and to sign up to receive recall emails when you make your toy purchases. In the United States, the Consumer Product Safety Commission ensures that toys do not contain harmful substances and chemicals. Many parents refuse to purchase products that are made in other countries where the manufacturing process has less strict standards and enforcement of regulations can be non-existent. To some parents, even the Consumer Product Safety Commission’s regulations are not as stringent as they would like, and sometimes toys are actually allowed by the CPSC to contain some levels of toxic chemicals. Toy manufacturers from the United States are more likely to ensure that their products only use paints that are completely safe and to provide handmade toys. There are companies in other countries that understand the importance of providing only the safest high-quality toys to children. These companies often make their toys from hand as well or use locally sourced bamboo to provide high-quality goods for parents around the world who are looking to provide safe products to their children. We have a great list of non-toxic baby toys that and perfect for parents and grandparents who want to only give their children toys that they know to be safe.